To see just how easy it is to use our recommended photo recovery software product – Recover My Photos – here’s a short video (less than 3 minutes) that shows it in use. In the first part, we delete a whole folder of photos from a USB memory stick. Then we use Recover My Photos to scan the device and find all the deleted photos that it can. Finally we check to see the photos have been successfully recovered. See how well it does! As you’ll see, it’s pretty straightforward to use Recover My Photos. Just set it to scan the device you want, and it’ll go off and find all the photos that have been deleted that it is still possible to recover. When you see that it’s found the photo files you’d like to recover, then it’s a simple case of selecting them and recovering them to a different device. Why Do You Have to Recover the Deleted Photos to a Different Device? Doing this just helps ensure that the recovered photo files get safely written somewhere else other than where other files that haven’t yet been recovered might still be…. If you tried to save them to the same device as they were originally deleted from, there is a danger that the first few recovered files that you saved would actually over-write the data for some of the remaining ones still to be recovered (and therefore making it impossible to do so). So, if you’re using Recover My Photos to recover files from say, a memory stick, or camera memory card, it makes sense to save them to the computer’s disk drive. Or, if you’re recovering them from the computer itself, save them onto a different partition of the disk (if one is available) or a USB disk or memory card. 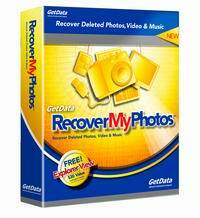 Here’s a link to our Step by Step guide to using Recover My Photos elsewhere on this site. Or get going now – click here to download Recover My Photos in a new window – and start recovering your deleted photos now!